Everyone loves taking pictures. And with iOS 7, Apple has attempted to improve the picture and video taking experience with a completely redesigned Camera app. First, let’s discuss the different ways to open up the Camera app, as it is the only app in iOS that has four different methods to launch it. Tap on the home screen. This should be very simple, as this was the original method to open up the camera. Find the camera icon, tap on it. 2. Slide the camera up on the lock screen. This method came out in iOS 5. 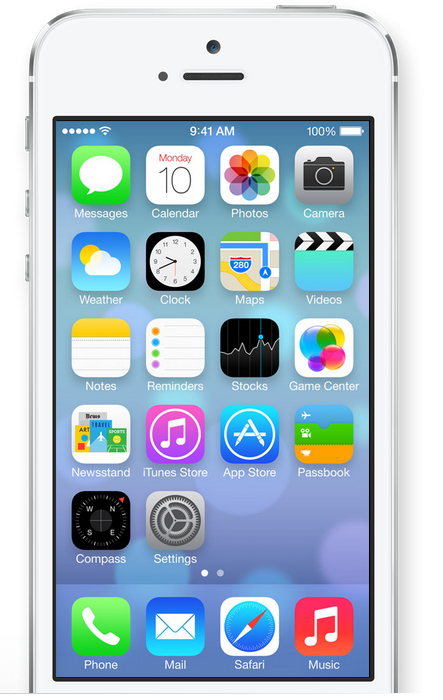 By swiping up the camera icon located in the lower right hand corner of the screen, it opens the camera. 3. Use Siri. Even though Siri came out with iOS 5, the ability to use Siri to open Apps did not come out until iOS 6 was launched. 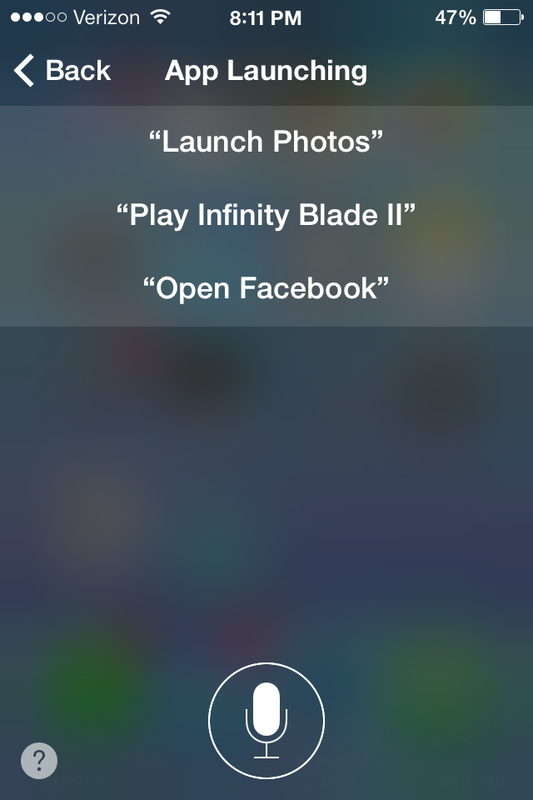 You can say “Open Camera,” or “Launch Camera,” and Siri will open up the camera app so you are able to use it. 4. Use Control Center. This feature is new in iOS 7. Control Center allows you to easily access your camera wherever you are on your iOS device. To activate Control Center, swipe up on any screen. 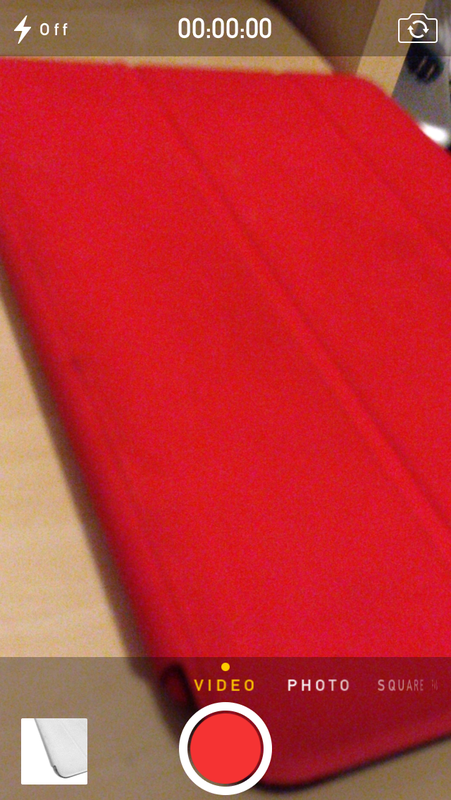 Then you can press the camera button in the lower right hand corner, which will then open up the camera app. Now that you’ve opened your camera, let’s discuss navigating between the different modes in the new interface. By default, it opens up to Photo. The image fills the whole screen. This is your standard mode for taking photos. Apple has also added a Square photo mode, and to get to it, you can slide the viewing area to the right. Square mode resembles Instagram-style photos. Slide once more to the right and you get the panorama mode. If you want to take a video, you can slide the screen all the way to the left..
Now let’s learn about taking pictures. The controls for Photo Mode and Square mode are exactly the same. Starting in the upper left hand corner you have the Flash control button. Tapping on that will allow you to turn Flash on or off, or have it set to automatically flash based on lighting conditions. The HDR button is in the top center of the screen. Tap on it to turn it either on or off. HDR stands for high dynamic range, and it takes three pictures in a rapid succession with different exposures. It then combines the three for the perfect picture. Keep in mind a few things if you are using HDR. You cannot take pictures in a quick, rapid succession, because of the intense image processing to create the HDR picture. 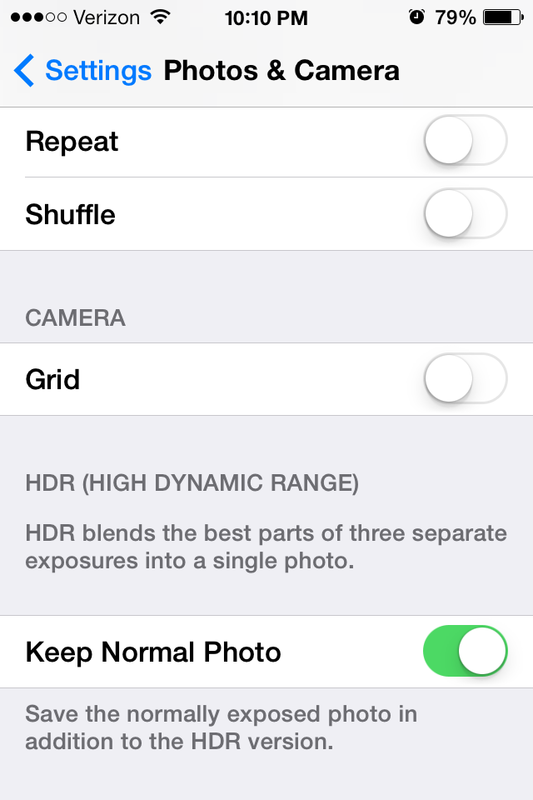 Additionally, HDR photos take up more room on the device by default, because in Settings under the Photos & Camera settings, Keep Normal Photo is turned on. This is also where you’ll find the option to turn on the photo grid. 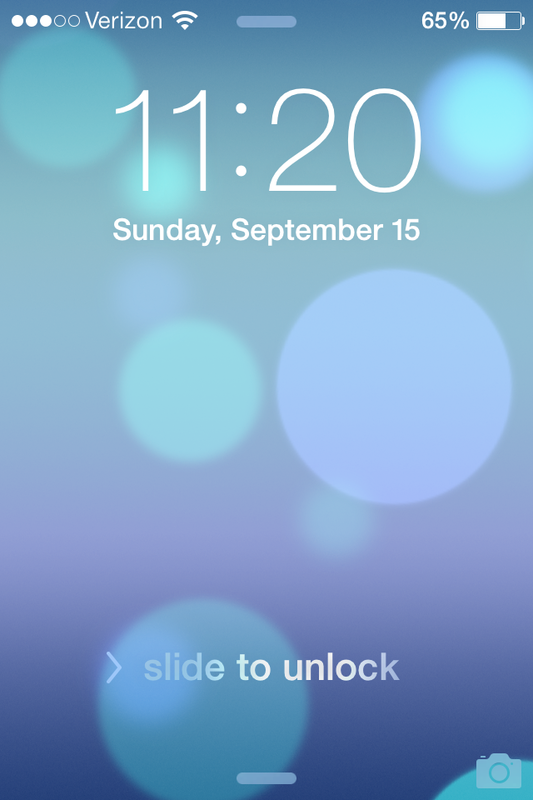 However, since iOS 7 Beta 4, filters have been on the iPhone 4S. The filter button will appear grey when not in use. When you tap the filter button, a zoom out animation appears, followed by 9 tiny preview screens with live filters. When you tap on one of the filters, the effect will be applied. If you don’t want to use a filter, press the none button to go back. Panorama is available on iPhone 4S, iPhone 5, iPhone 5c and iPhone 5s and fifth generation iPod touch. 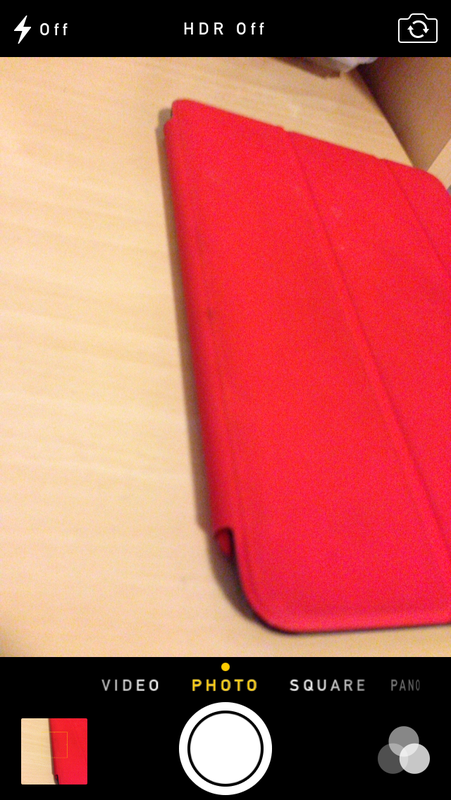 Panorama works exactly the same as in iOS 6, with just a minor change in the color of the buttons. Taking videos also works exactly the same as it did in iOS 6. Press the red button on the bottom of the screen or the volume buttons to record. You can also take videos with the flash on, which is great if you are trying to take a video in low light. To do so, just tap the flash button in the upper left hand corner. If you own an iPhone 5s, you’ll have a few additional features in the Camera that are exclusive to it, such as True Tone Flash, Burst Mode, Auto Image Stabilization, and Slow Motion Videos. Hopefully this will help you enjoy taking pictures and videos in iOS 7.